A sufficient supply of Magnesium is as essential for the growth and wellbeing of reef building coralline algae as Calcium. It is one of the major constituents of seawater and is directly involved in algae photosynthesis, i.e. the conversion of carbon dioxide (CO2) and light into organic compounds. The addition of plain magnesium salt, however, is not sufficient and interferes with the ionic balance of the tank water. 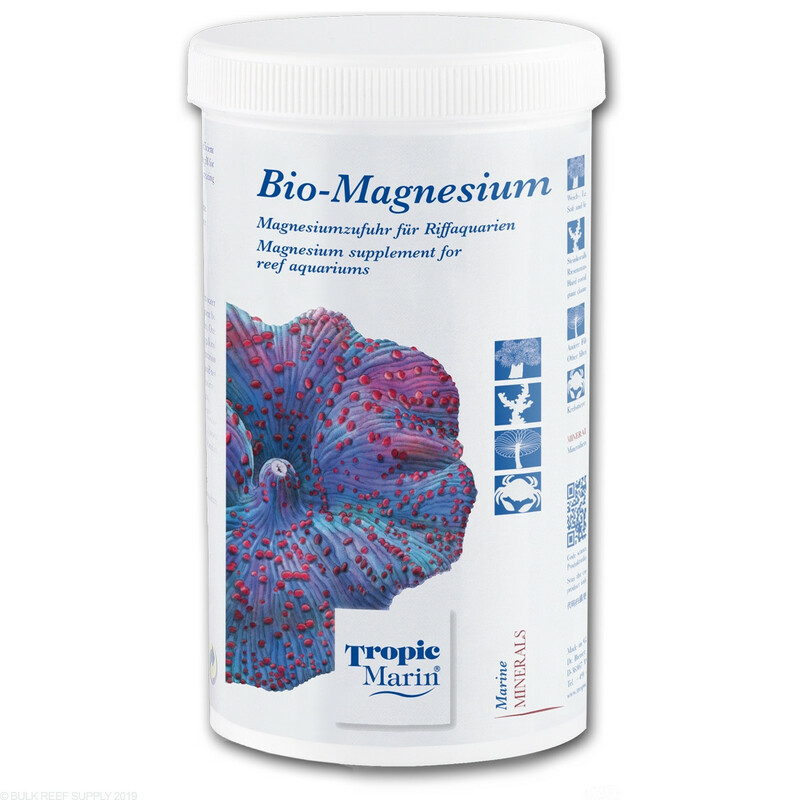 Tropic Marin Bio-Magnesium creates a natural environment in the aquarium and delivers Magnesium and carbon dioxide in a natural, biologically available ionically balanced form. The natural concentration of Magnesium is 1280-1300 ppm. Calculate the total system water volume and begin by measuring the magnesium concentration of your aquarium water. One level measuring spoon increases the magnesium level of 30 US-gallons / 110 l of tank water by about 10 ppm. The recommended maximum dose is 2 measuring spoons per 30 US-gallons / 110 l of aquarium water per day! Sprinkle one measuring spoon full of Tropic Marin Bio-Magnesium onto the surface of the water, where it is being circulated by your pump. Take care not to allow a larger amount of undissolved Bio-Magnesium to come into contact with invertebrates. Wait for each spoonful to dissolve completely before adding the next. Check the aquarium waters specific gravity on a regular basis as this may gradually increase over time with the addition of Tropic Marin Bio-Magnesium. This is easily counteracted with regular water changes. An excessively high magnesium concentration may have a negative effect on certain organisms. For this reason, it is not recommended to exceed magnesium concentrations over 1600 ppm.